In his State of the Union address, President Obama again voiced his support for a $10.10 minimum wage. We had a fast food strike last fall calling for $15/hr. Two of the Democratic candidates for RI Governor have voiced support for a $10 minimum wage and there's legislation pending in the RI General Assembly that would increase the minimum wage to $9/hr. While the people behind those proposals may be well-meaning the reality is a minimum wage hurts the very people it's supposed to help. 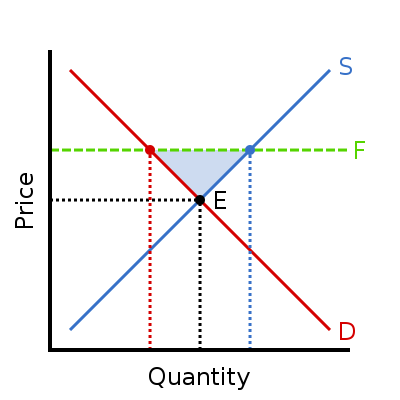 Below is a supply and demand graph illustrating the effect of a minimum wage on employment. I'll try not to get too technical, but I do have to explain it, so bear with me. In the graph, the downward sloping 'D' line is demand, the upward sloping 'S' line is supply. What the graph is illustrating is as the price increases, suppliers will want to sell more, but at the same time, demand shrinks because buyers want to purchase less. Eventually they meet at 'E'. In labor markets employees are the sellers and businesses are the buyers. A minimum wage raises the price from 'E' to whatever the new wage is, and if a worker cannot produce enough value to meet that wage he will be unable to find work. Typically the people working for minimum wage tend to be less-educated and less-skilled individuals, so a minimum wage prevents the very people the wage is meant to help from being hired in the first place since any job that is worth less than the minimum wage is now illegal. Minimum wage proponents love to trot out studies that show no negative effects from raising the minimum wage as supporting evidence for their position. Yes, there are various economic studies that have been published claiming to prove that raising the minimum wage has no negative effect on employment. Unfortunately the studies have (at least!) one basic, but critical flaw -- they can't measure if labor was substituted. Economic substitution is the idea that people can substitute one good for another. A terribly simplistic example of this would be if the cost of gas goes up, you have to decide if that gas is still worth purchasing. In order to reduce your consumption you could drive less, or use alternate transportation such as carpooling. Another possible option is to trade in your existing vehicle for a more fuel efficient vehicle that uses less gas. Those same options are available to businesses -- if the cost of labor goes up, a business must decide what to do. A business could hire fewer people, get the existing employees to take on additional responsibility, or use something other than people to get the work done. For example, a fast food business decides that in the new restaurants they're building they're going to use the self-service kiosks for order-taking and an automated burger machine to make the hamburgers. That way they can use fewer, but more productive employees. So while they normally would have hired 10 unskilled people at the old $8/hr minimum wage, at $15/hr they hire 6 skilled people. In the end the move will translate into a cost savings for the business. But what of the 10 unskilled workers that weren't hired? Since they aren't able to produce $15/hr in value, there is no job for them and they remain unemployed. For sake of argument however, let's ignore that flaw in the studies and take their conclusions at face value. If there truly was no negative effect from raising the minimum wage, why are proponents only shooting for a small increase? If there are all benefits and no costs, supporters logically should be arguing for a $25 or $50 minimum wage. That would certainly help out those at the bottom of the income scale a great deal more rather than a measly $2 increase. The most common rebuttal to that line of questioning is something to the effect of "if drinking one beer helps you relax then drinking 25 beers is even better." That rebuttal however, is as fallacious as their original argument. We only know binge drinking is bad for you because we have evidence showing a negative effect from binge drinking. That leaves supporters with two irreconcilable positions -- either raising the minimum wage has no negative effects as their studies conclude, which means their beer analogy fails and they have to explain why they're being so cheap, or they are forced to admit that raising the minimum wage does indeed have a negative effect, despite what their studies conclude, which means their entire argument falls apart and now they must justify why anyone should support hurting one group of poor, low-skilled people for the benefit of another group of slightly less-poor, slightly less-unskilled group. It is a noble goal to help low-skilled, low-wage individuals, but you don't help them gain the skills necessary to move up the ladder to higher wages by cutting off the first couple rungs of that ladder. We should eliminate the minimum wage and allow people and businesses to come to mutually beneficial compensation agreements without government intervention.